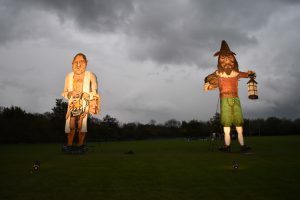 It’s become Kent’s most famous bonfire celebration primarily because for the last 20 years the local bonfire society has been poking fun at infamous celebrities. 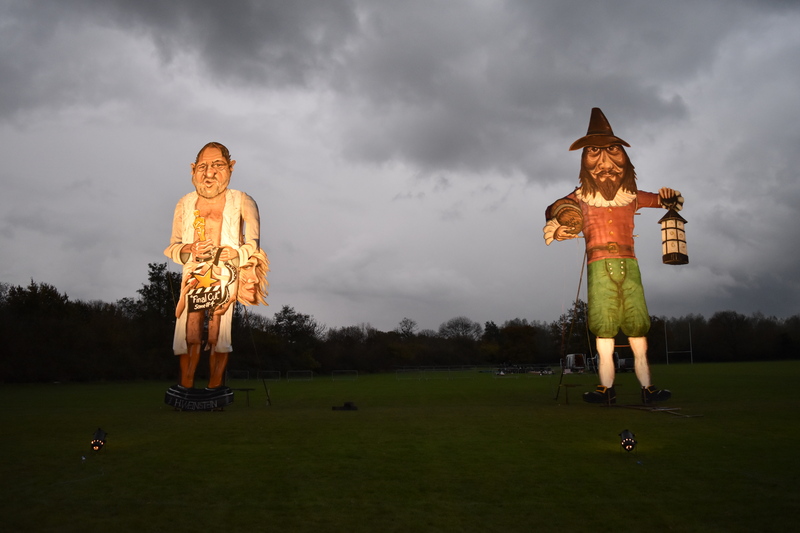 Each year a giant 11m tall effigy is created by the talented team which stands alongside another giant effigy of Guy Fawkes (pictured below right) and on the night they are set alight at the start of the huge fireworks display. Past targets have included Harvey Weinstein, Donald Trump, Katie Hopkins and Lance Armstrong. It’s not all about the giant effigy, although this is what encourages all the media interest in our town during the run up to Bonfire Night, but it’s about all the activities which take place before the main event. It’s an event which local schools, pubs, community groups all take seriously and you’ll find various members of our community busy constructing floats and costumes for the big torch-lit procession. Thousands of people attend the event to watch the procession as it goes through the town centre, twice, just so you don’t miss anything and it culminates at the recreation ground. As well as the local groups taking part, Edenbridge also has other visiting Bonfire Societies joining in the procession and enjoying the activities and entertainment on the night. 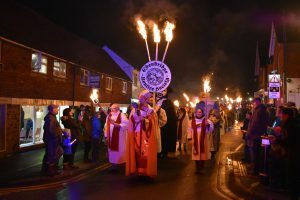 Edenbridge Bonfire Society is one of two societies in Kent who are included in the Sussex Bonfire Calendar, and the bonfire season runs from the beginning of September through to the end of November. It may seem odd to start the bonfire season so early but this gives all the local societies their chance to have the spotlight on their individual events. Members of the Edenbridge Bonfire Society can be found at a number of the other bonfire events during the season, traditionally dressed in their choirboy outfits, to provide support to the other societies as well as having a fantastic time and fun social evening out. The Edenbridge Bonfire Society is a not-for-profit organisation and each year raises more than £5,000 for local charities. As the procession passes by you’ll hear the rattle of collection boxes along the route, so be sure to have plenty of change in your pockets to donate to local causes. Putting on such an event is no small task and on the night itself a team of over 100 volunteers work hard to stage the event. The Bonfire Society is also grateful for the support it receives from local businesses who donate money to ensure the tradition continues. You can keep up to date with all the developments in the run up to this year’s event, including information on road closures, by visiting the website, www.edenbridgebonfire.co.uk, or following them on Facebook or Twitter.